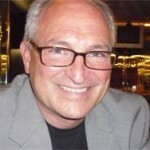 Thursday, March 27th, 2014 – This blog begins with my surgical experience with Dr. Christopher Main, DO a Board Certified Orthopedic Surgeon with the Midwest Bone and Joint Center located with offices in Macon, Kirksville and Moberly, Missouri. Upon returning to the Moberly Regional Medical Center, I was well received by my pre-op nurses Janice and Melissa as they got me prepped for surgery. They had remembered me from last year. I was looking forward to seeing Dr. Main all over again for round #2 as I had been so pleased with my surgery from last year . I wanted to get rid of the instability problem in my right leg-proximal tibiofibular joint now too. 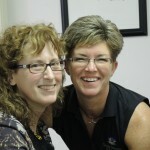 Dr. Main’s assistants,Kathleen and Loree, took good care for the pre-surgical details at his office the day before as discussed towards end of my last blog. 1. 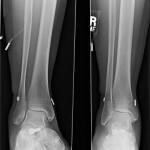 Dr. Main found less damage to my right fibula head bone as compared to how soft/spongy my left fibula bone had been from its chronic condition of instability. 2. Dr. Main and I had discussed my right ankle joint still having some slight pronation and pain around the distal tib-fib. 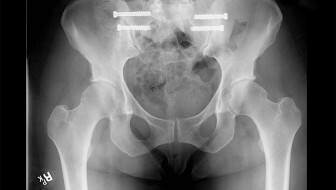 During surgery after doing the proximal fixations and tightening of the proximal syndesmosis, he checked the distal syndesmosis and it still showed some slight instability. 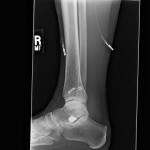 He therefore went ahead and placed another Arthrex TightRope Fixation into the distal tib-fib of the ankle. 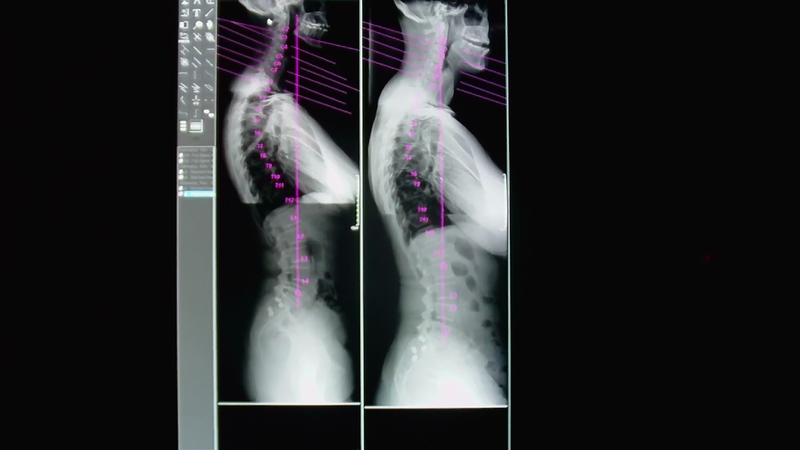 All the fixations can be seen in the X-rays below in this blog. 3. My Common Peroneal Nerve (CPN) of my left leg had already been decompressed with my prior Peripheral Nerve Surgeries; whereas, Dr. Main needed to decompress the CPN while doing the joint fixation as a standard protocol while operating around the CPN. 4. 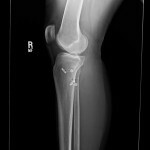 My right Proximal Tib-Fib Joint Instability was diagnosed within 6 months of major symptoms as compared to my left leg that had at least 10 years of dysfunction leading up to surgery. That chronic left tib-fib joint dysfunction had created secondary chronic muscle spasms and nerve compressions of my left leg; whereas, my right leg muscles and nerves were not damaged. 5. Dr. Main has further perfected his surgical incision to be a little shorter now without crossing the bend of the knee; therefore, less pain on bending the knee at the surgical site during post-operative rehab as compared to my left leg. 6. Dr. Main now uses a PRP injection(a therapy using my own blood with high levels of platelets containing growth factors, esp. for acceleration in healing and regeneration) into the surgical fixation as part of his surgical protocol. 7. This time for me, Dr. Main applied the Ossur Brand post operative knee immobilizer locked in full extension over my ace wrapped leg. When I needed to get out of bed or simply to just move my leg in bed, this brace was a tremendous blessing in not allowing my leg to bend. It also made it easier for the nurses to help me to the portable bedside toilet. For me, the bending of the leg initially creates pain over the medial side of the tibia where the fixations come through the bone more so than at the lateral surgical incision site. Believe me when I say, both surgeries made my proximal shin feel like it had been beat to death and any movement was very sharp pain in those first few days. 8. I didn’t have the Game Ready Ice Machine right after surgery last year; but this time around, I rented it from Dr. Main’s office right away and that helped the pain too. For me, there is a big difference between a Breg Kodiak Polar Care supplied by the hospital and a Game Ready. I chose the Game Ready Icing because it felt colder and more pain relieving. 9. After surgery in the Post Anesthesia Recovery Unit, my RN-Nikki took such good care of me. This time around I was given Fentanyl in my IV instead of Demerol. I had learned from last year’s surgery through my attending friend that she noticed Demerol in my IV or by injection made me very agitated and angry as she witnessed my personality change. This time around I was happy, peaceful and not angry while on the initial doses of Fentanyl till I had enough food in my stomach to take oral pain medication. 10. This is an outpatient surgery; however being from out of town, I was glad to have an overnight observation just like last year. It would have been too difficult to manage in a hotel room that first 24 hours. 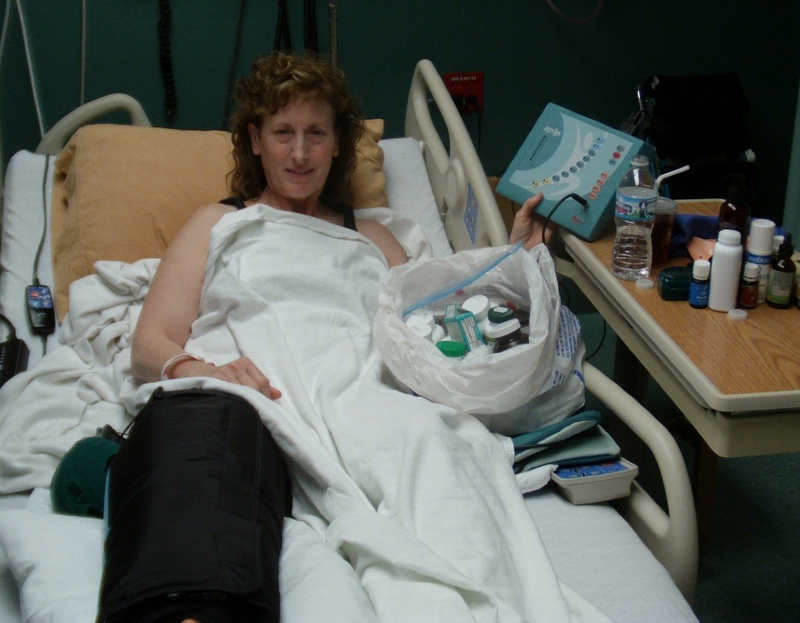 Friday 3-28-14– While at the hospital this next day, the physical therapists started me on the CPM machine to move my knee. Initially I was apprehensive, but the machine can move your leg very slowly and increased in speed as tolerated. I adapted to it very quickly and ultimately for me it does feel good to move the knee. 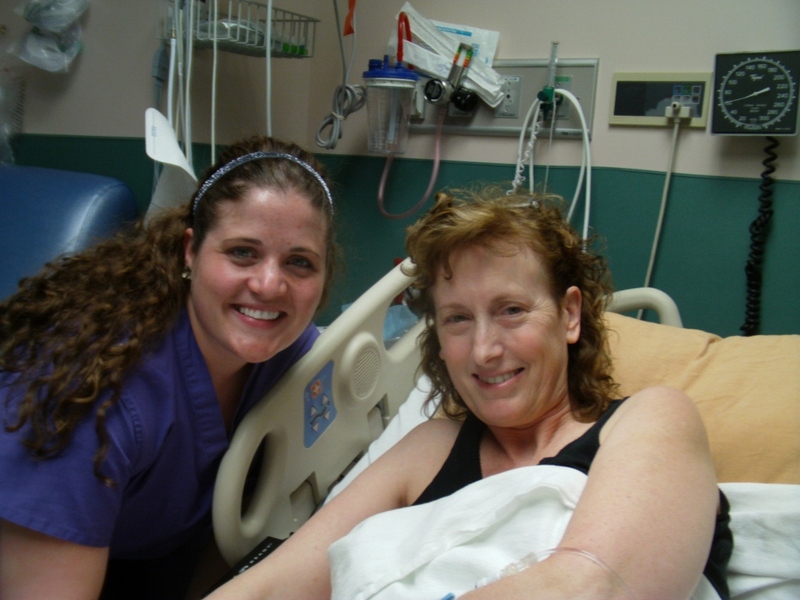 Here is my youtube video right before leaving the hospital thanking Cissy-who was just one of all the nice nurses that took such good care of me at the Moberly Regional Medical Center, Moberly, Missouri. We went back to our Comfort Inn Hotel just around the corner. I’m so thankful for my friend Jessica that hauled all the equipment in and out of the hospital and hotel. Sun. 3-30-14 – This morning was my last dose of Hydrocodone 10/325 pain medication. I didn’t need it nor any other OTC medication. From this point forward, I only took my Traumeel Arnica Homeopathic Drops besides my normal box full of natural supplements. The Game Ready Icing was my pain relief. My friend Jessica and I went to church that morning and then we went out for lunch to a mall in Columbia, MO 30 miles away. While at the mall, we had some fun and decided to go into the Sleep Number Store. It felt good to get out of the wheelchair and stretch out on a new Select Comfort mattress. The salesman, Robbie, started asking me questions about my leg surgery and come to find out he knew Dr. Main, my surgeon, very well. He spoke very highly about Dr. Main too. Dr. Main takes care of many High School and College Athletes of the region and Robbie is an athletic coach also. Being in a such a light happy-go-lucky mood and wanting to have some laughter, Robbie joined in our video fun that my friend and I were having. Most of my videos are just serious informational videos throughout my blogs, but I couldn’t help but to include this rather stupid funny one here. The spoof being that how could I be resting after surgery if I was rolling around a mall 30 miles away from our hotel. I really did feel just fine and I did not hurt any more by having my leg down a lot that day. I just elevated and iced it throughout the night when we did get back to the hotel. 4-1-14 – “Simply Massage of Moberly” owned by Shannon Paulsen, LMT gave my friend and I excellent therapeutic massage. This day was my 3rd massage already since surgery. For me it was wonderful again to get face down on a table. 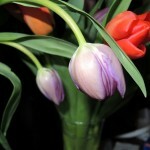 I also believe very strongly in stimulating the body to help detoxify the body from anesthesia. I always strive to give my body the best help in order to heal the quickest. 4-2-14 – My last appointment at Dr. Main’s office 6 days after surgery. I felt much farther ahead in healing with this leg as compared to last year’s left leg at this point post operatively. During this appointment he had a medical student shadowing him. I told the student that I am not a typical patient so to please take a seat and listen while I asked my many questions of Dr. Main. I feel responsible to my readers and to the patients that call me through my website to provide as much detail and accuracy as possible in my blogs; and therefore, I had general questions of Dr. Main besides my own personal concerns. Even though Dr. Main is very busy running between several offices in order to help a larger geographical area of patients, he certainly does spend quality time listening to his patients. His practice offers the best of both Sports/Orthopedic Injury Primary Care and Orthopedic Surgical Interventions. He has always told me that listening closely to his patients makes diagnosing them much easier. He doesn’t limit himself to just diagnostic tests. For that alone, I am forever grateful or I would not have been helped. Every dollar spent to come from Idaho to Missouri has given me dividends back to my muscular-skeletal system and the ability to eliminate joint instability. 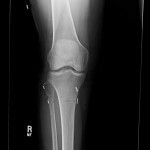 This Proximal & Distal Tibiofibular (Tib-Fib) Joint Instability not seen on X-ray or MRI is something that Dr. Main has an excellent working knowledge about; and therefore, he is willing to help a patient surgically when conservative measures have failed to stabilize the joints. Regarding my leg, Dr. Main said, ” She is doing very well…The incision lines appear to be healing very well….Active knee ROM is full extension with flexion to 125 degrees, active ROM about the ankle is dorsiflexion to +8 degrees, plantar flexion to 40 degrees and inversion/eversion appear to be within 20 degrees. Maintain NWB status to right lower extremity for 6 weeks while doing physical therapy persisting with overall ROM exercises and pool therapy at 3-4 weeks postoperatively based on the incisional healing.” Dr. Main said I could move my leg in any way up to pain tolerance except for no vertical weight going through the leg for the 6 weeks. This NWB helps the fixations and the ligaments to heal properly. Saying goodbye is never easy. I really do hate the fact that I cannot return to see Dr. Main and his wonderful staff for my follow up appointments. Skype by computer is the next best thing. I do rely on the team of my local primary doctors to keep a direct eye on my surgical healing should any concern arise to be reported back to Dr. Main. My leaving prayer of faith is that I can return one day for Dr. Main and his staff to see me walking into their clinic as a completely healed patient. I did fine for a 3 hour ride back to St. Louis from Macon, Mo. We ended this day’s evening at the Hilton Hotel by the St. Louis airport as they offer wheelchair assistance in their hotel. I could have never walked the distance on crutches in some other hotel that did not have a wheelchair. I did a lot of leg elevation and icing that night knowing that I would have a long day of flying the next morning back to Idaho. Thursday, 4-3-14 – What a day of flying! Delta wheelchair service is the way to go. However, an additional 3 hour delay on top of our 2 hours of normal connecting time in Salt Lake City due to mechanical problems on our connecting flight to Lewiston, ID just about had me in tears. As I couldn’t take the sitting any longer with my leg down, I literally had to get on the floor of the airport and stretch out. I put some clothing under my leg to protect from the dirty carpeting. I took the brace and Ace wraps off my leg and massaged it with my Young Living Essential Pain Oils and I used instant ice packs that I carried. A dose of Diazepam 5mg for anxiety and muscle spasms in my buttocks giving me burning pain and then I was good to go. We finally arrived safely back to Lewiston and I had a date with my couch the rest of that evening. The end of another out of town surgical vacation! My next blog will be my post surgical recovery as it unfolds. Stay tuned!